Hello. I'm David Michaelis, Centre Director of Mathnasium of Country Hills, your neighbourhood math-only learning centre. We help kids in grades 2-12 understand math by teaching the way that makes sense to them. Mathnasium Country Hills in NE Calgary is helping Calgary students who want to keep up, catch up and get ahead in math throughout the school year and summer. Our Math learning centre in Country Hills is here to support your children in math learning. Call us today. Our tutors teach math to kids the way they understand. We help with math homework, math tutorials and mathematics education to stay ahead. The centre is now open! Contact us for more information. Great program I just wish I could afford it. My daughter loves Mathnasium, she has improved long way her math skills.. highly recommended for those who struggle at math or even if you want your kids to be better!!! Since attending Mathnasium my daughter has demonstrated great improvement in both her skills and confidence in math. All of the instructors are fantastic! My kids love the way they teach. 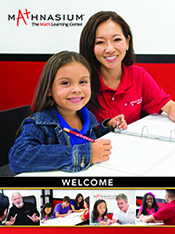 Very organized and a variety of tutors on hand to help with your child's independent needs. Our experience has been great so far. I am pleased with the learning plan and then support and encouragement my daughter is receiving. My daughter did not like math as she found it to be a challenge. I knew she needed extra support and that is when I looked into Mathnasium. She has been there for just over a month now and has gone from an average grade of 64% on her exams to 92%. Not sure I can quite say that she loves math but she sure enjoys it more that that she has gained a better understanding. Dave and Priyanka are fantastic! Very hands on and direct teaching. Experienced and friendly staff who will make an effort to teach you what you need to know. Helps you build mathematical foundations.